"It would be some advantage to live a primitive and frontier life, though in the midst of an outward civilization." - Henry David Thoreau, from the first chapter of Walden pond. 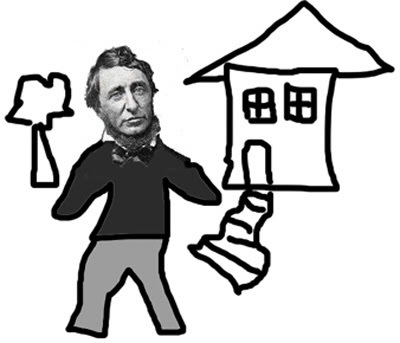 Thoreau made history in 1845 when he borrowed an ax from Bronson Alcott and began developing a small section of Ralph Waldo Emerson's land on Walden pond. This was his experiment in Transcendentalism, etching out a "life in the woods" on the fringes of Concord's society. But the mythology of this experience, recorded later in On Walden Pond, is what really made history. The ideals of self-sufficiency, solitude, and love of nature that Thoreau recorded here have been imprinted firmly onto the American consciousness. Thoreau's view of Nature underscored this entire project. Unlike his Puritan predecessors, who considered the wild to be a chaotic and dangerous place, Thoreau was deeply steeped in a romantic vision of the natural world. It was a place of peacefulness and purity, where humans could go to revive their primitive vitality. Above all, Nature was the backdrop for self-reflection, a retreat away from the restless mobs living lives of quiet desperation. Thoreau penned some of the most eloquent descriptions in American literature of the beauty of the natural world. The woods were not just a place to observe as a visitor, but the place in which humans could truly live. Yet, It's well known that Thoreau's actual experience at Walden pond did not exactly measure up to his idealization of it. Thoreau was no hypocrite. He admits as much. During his two years there, he would often make the mile and a half trek back into Concord on the weekends. Emerson's nearby house was a frequent stop for food and conversation, and the young philosopher would famously bring his laundry into town to be done. The train passed right by his cabin, and Thoreau could even hear church bells ringing on a Sunday morning. Walden pond was the iconic suburban haven, if only a little ahead of its time. It really offered the best of both worlds. At that time only the rich or strongly determined could have their own Waldens, but within the next few decades technological advances opened up the opportunity for a wider range of people. By the 1850's suburbs were being planned and marketed specifically for their communion with Nature. During his last days at Walden, Thoreau worried that the track he had made from the cabin down to the pond was becoming excessively worn with use. He had noticed that others were using the trail. He may have been more right than he realized. But there is a more charitable way to interpret Thoreau's legacy. Perhaps this suburban pioneer was like early missionaries sent from the West to indigenous cultures. While they may have helped precipitate the flow of colonialism, they also were instrumental in protecting the natives from its deadlier impacts. If Thoreau just stepped out in advance of the inevitable economic shift to suburban development, then his calls to live a simple life could have offered a prophetic check against some of the excesses often associated with life in the suburbs. Maybe smothering Nature with love is at least better than paving it over out of convenience. Who knows? How would you like your downtown?